Each Sunday here at StuckatTheAirport.com is Souvenir Sunday – when we take a look at some of the fun, inexpensive (under $10) items you can buy at airports. 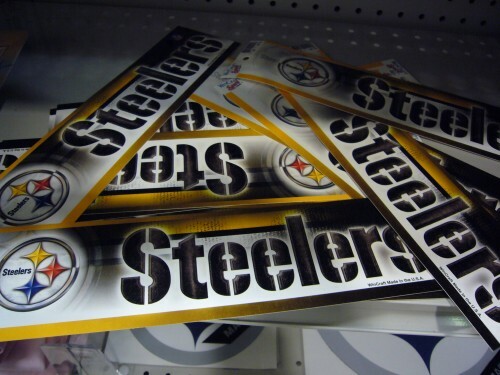 This chocolate hockey puck was cute and tasty, but these Steelers stickers – for sale at the airport Rite Aid for just $2.19 – were by far the best deal. But my favorite item for this week’s Souvenir Sunday has got to be these jars of “Pittsburgh Penguin Poop” candy – another entry in our growing list of “poop” candy sold at airports. Have you spotted a great souvenir while you were stuck at the airport? If it cost less than $10, is “of” the city or region and is, ideally, a bit offbeat – please take a photo and send it along. Your souvenir may be featured on a future edition of Souvenir Sunday. Hi , that is a quite interesting article. I have never been thinking of these small things we can buy from the airports 🙂 . Especially these Penguin Poop candy made me laugh and I definitely would like to try them:) Once at Gatwick airport I have noticed bottles of beer in different shapes. It was not expensive at all, about £4,50 , but it was funny. If you need some airport details, please check our website- http://airportdata.aero.